MOSCOW, Dec 31 (PRIME) – Russian banks bought 181.4 tonnes, or 5.834 million ounces of gold in 2013, which is 8.3% more than in 2012, a Finance Ministry source told PRIME on Tuesday. “Gold still protects investors from currency risks and is the core of currency reserves of each country given the current economic instability,” the source said. The Russian Gold Union says the country’s gold mining will increase 4.7% to 205 tonnes in 2013, while the overall production of the yellow metal will increase to 240 tonnes. Russia’s monetary gold reserves increased by 56 tonnes to 1,014 tonnes as of December 1. 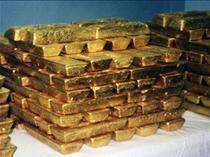 Sberbank bought 48.5 tonnes of gold, more than any other bank in 2013. VTB bought 38.9 tonnes, Gazprombank 29.1 tonnes, Nomos bank 19.6 tonnes, Lanta bank 8.6 tonnes, Asian-Pacific Bank 6.7 tonnes, Baikalinvestbank 6.5 tonnes, Promsvyazbank 4.8 tonnes, Uralsib 3 tonnes and FIA-Bank 1.9 tonnes.